Made with porcelain, this beautiful heart is a lovely decoration for the home. It hangs easily with its attached piece of twine and comes in neutral colouring with its cream colour base and indented typical East of India black text - ideal for most rooms in the house. 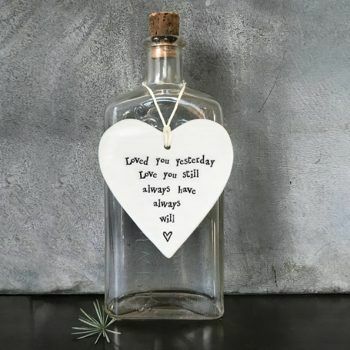 Popular words of inspiration making it an ideal gift for lots of occasions.